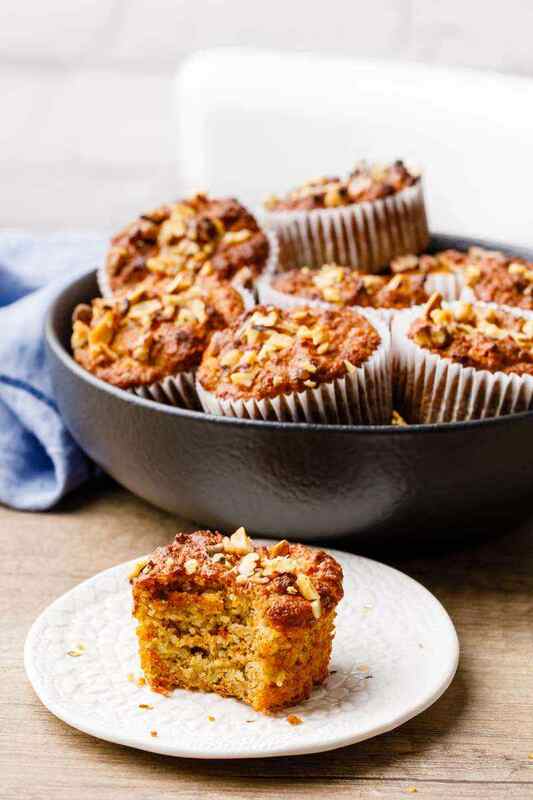 These addictive and soul-satisfying paleo muffins are easy to make, nutrient-dense and are perfect for a portable paleo-friendly breakfast or healthy snack. 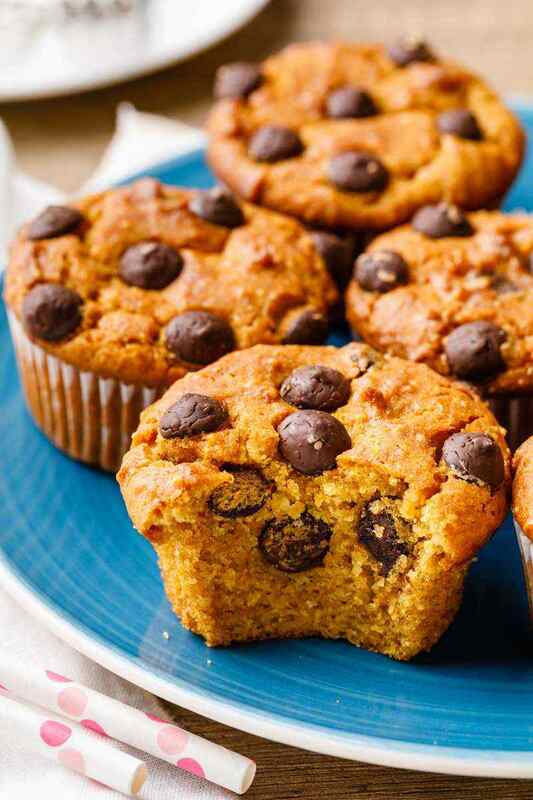 Created for all baking seasons, you’re sure to find a muffin recipe that will soon become one of your new go-to’s and family favorites. 1. Preheat oven to 350ºF. 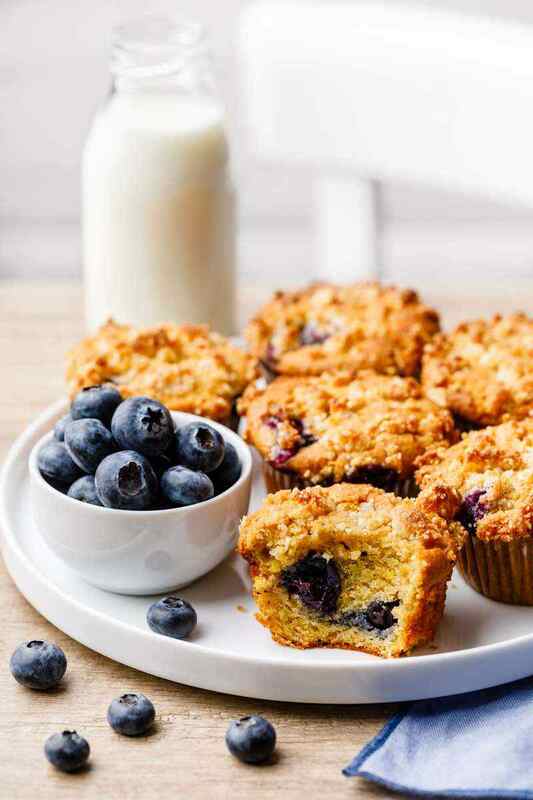 Line a 12-cup muffin pan with paper cups. Set aside. 2. Wash the blueberries and gently pat dry with kitchen towel. Set aside. 3. In a bowl combine the almond flour, baking soda and pinch of salt. Set aside. 4. In the bowl of a stand mixer fitted with the paddle attachment beat the eggs and honey until pale and fluffy, about 3-5 minutes. Add the almond butter, coconut oil and lemon zest and beat until well combined. Add in the almond flour mixture and beat until smooth. Gently fold in the blueberries. Scoop the batter into the prepared muffin cups. 5. To make the crumb topping, combine the almond flour, unsweetened shredded coconut and chopped almond in a bowl. Add in the honey and coconut oil and mix with a fork until large crumbs form. Sprinkle the crumb topping evenly over batter in each cup. 6. Bake in preheated oven for 15-20 minutes or until a toothpick inserted into the center comes out clean. Remove from the oven and allow to cool completely before serving. 2. In a bowl combine the almond flour, baking soda and ground cinnamon. Set aside. 3. In the bowl of a stand mixer fitted with the paddle attachment beat the eggs and honey until pale and fluffy, about 3-5 minutes. Add the melted ghee and almond milk and beat until well combined. Add in the almond flour mixture and beat until smooth. Gently fold in the pear cubes. 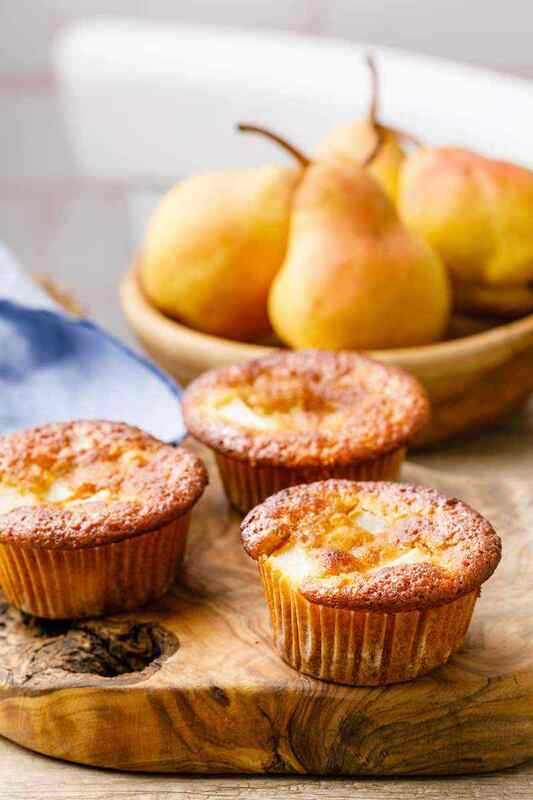 Scoop the batter into the prepared muffin cups. 4. Bake in preheated oven for 25-30 minutes or until a toothpick inserted into the center comes out clean. Remove from the oven and allow to cool completely before serving. 2. In a bowl combine the almond flour, coconut flour, shredded coconut, baking soda, baking powder, cinnamon and salt. Set aside. 3. In the bowl of a stand mixer fitted with the paddle attachment beat the eggs and honey until pale and fluffy, about 3-5 minutes. Add the mashed banana, vanilla extract, grated carrot and grated apple and beat until well combined. Add in the almond flour mixture and beat until smooth. Fold in the chopped pecans. Scoop the batter into the prepared muffin cups. Sprinkle with extra chopped pecans. 4. Bake in preheated oven for 30-35 minutes or until a toothpick inserted into the center comes out clean. Remove from the oven and allow to cool completely before serving. 2. In a bowl combine the almond flour, baking soda and pinch of salt. Set aside. 3. In the bowl of a stand mixer fitted with the paddle attachment beat the eggs, coconut sugar and maple syrup until pale and fluffy, about 3-5 minutes. Add the almond butter and pumpkin puree and beat until well combined. Add in the almond flour mixture and beat until smooth. Gently fold in the chocolate chips. Scoop the batter into the prepared muffin cups. Sprinkle with extra chocolate chips. 4. Bake in preheated oven for 20-25 minutes or until a toothpick inserted into the center comes out clean. Remove from the oven and allow to cool completely before serving. 1. In a saucepan place the sweet potatoes and cover with water. Bring to a boil over high heat then reduce the heat to medium, and simmer until the sweet potatoes are tender, about 20-25 minutes. Remove from heat and drain well. Return the sweet potatoes to the saucepan and mash with a potato masher until smooth. Set aside ½ cup and reserve the rest for another use. 2. Preheat oven to 350ºF. 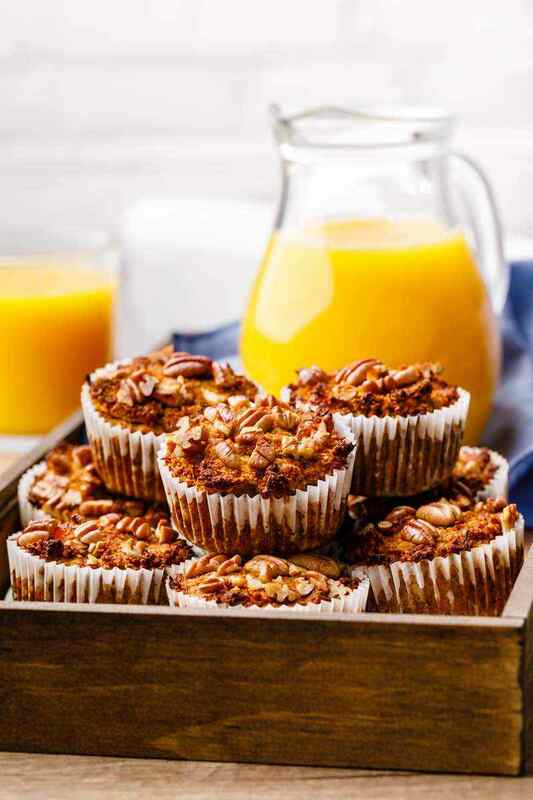 Line a 12-cup muffin pan with paper cups. Set aside. 3. In a bowl combine the almond flour, baking soda, baking powder, cinnamon, nutmeg and salt. Set aside. Grate the apple and squeeze it well. Set aside. 4. In the bowl of a stand mixer fitted with the paddle attachment beat the eggs and honey until pale and fluffy, about 3-5 minutes. 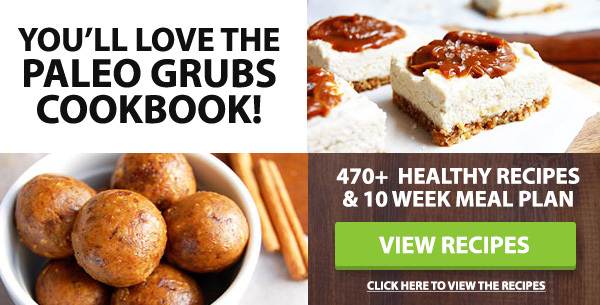 Add the almond butter, grated apple and ½ cup of sweet potato puree and beat until well combined. Add in the almond flour mixture and beat until smooth. Scoop the batter into the prepared muffin cups. Sprinkle with chopped walnuts. 5. Bake in preheated oven for 25-30 minutes or until a toothpick inserted into the center comes out clean. Remove from the oven and allow to cool completely before serving.